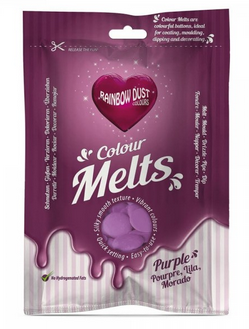 We now have the complete range of the brilliant and easy to use Rainbow Dust colour melts available from our cake decorating shop, Knowle, Solihull. No need to temper your chocolate, with the new Colour Melts from Rainbow Dust you can achieve a beautifully smooth coating for any decorative treat. These chocolate melts are perfect for decorating wedding cakes, birthday cakes, celebration cakes and cupcakes. These vibrant Colour Melts work similarly to chocolate but are ready tempered so you simply have to heat them in the microwave in short bursts and you are left with a delicious, creamy coating for your cake pops and other baked delicacies. Not only do they provide a smooth, even coating however, they also taste fantastic and contain no hydrogenated fats like other similar products such as candy melts or merkens. They also don’t have a waxy taste like some other brands. The colour melts are also great for to use over stencils and with the addition of some cocoa butter to thin them down, you can even paint with them, allowing you to paint your own candy designs onto cookies, cakes and cupcakes. The colour melts are great for use in a wide range of silicone and candy moulds as well as dipping for cake pops. Rainbow Dust are a well-established cake decorating company with many years’ experience in creating some of the best loved decorating products including lustre dusts, edible glitter and food art pens. 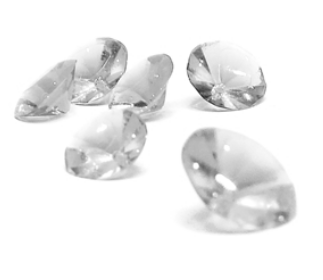 With the Colour Melts, you can be sure that the same care and attention is given to create such a high quality product. • Place your colour melts into a microwave bowl. • Heat on full power in 30 second burst and stir well between heating. • Do this until your colour melts are liquid. • Pour your candy melts into your mould or over your cakes for fillings and run outs. Contains E120 – not suitable for vegetarians or vegans. We have a great selection of over 50 cake flavours to choose from and although fruit cake may be the traditional flavour for wedding cakes we offer a whole range of delicious cake flavours which are freshly baked in our bakery for the modern bride to choose from. Wedding cake designs don’t just stop at the decorations and choosing a different delicious cake flavour to compliment your wedding cake design is as important. You can decide on a different flavour for each tier which will create all sorts of contrasting flavours with a combination of inventive fillings to really surprise your guests, once the cake is cut. Have a look at some of our most popular flavours to help you choose the perfect wedding cake design. Fruit cake: A must-have flavour for the traditional bride. Fruit cake goes a long way and with a very generous shelf life, making it a great choice for preservation or sending pieces to those that couldn’t attend the day. Traditionally, the bottom layer of a wedding cake was cut at the wedding, with the middle tier being served to guests and the top tier being kept for the christening of the couple’s first baby. Chocolate: A perfect choice for chocoholics and a guaranteed hit with most of your guests. Chocolate cake can vary in richness and works well with an endless list of fillings. Put a unique spin on this classic flavour with different filling such as mint or really treat your guests with a chocolate fudge filling. Vanilla: This classic sponge wedding cake flavour remains the most popular flavour for our wedding cakes and will be popular with your younger and older guests. Vanilla makes a great base for just about any flavour and can be combined with a wide selection of different fillings. Red velvet: This ever popular silky smooth cake flavour is irresistible as it not only looks great but tastes amazing. Hide underneath white icing for a surprise colour when the cake is cut or make a real statement with a red velvet naked wedding cake. White Chocolate with Raspberry: This winning combination is perfect for those looking for a flavour with a difference. The sweet white chocolate really comes to life when paired with the fruitiness of the raspberry filling. Perfect for bringing something a little unique to your wedding cake. Lemon: A great choice for summer cakes. As one of the most popular flavours you can guarantee lemon cake will go down well on your day. Carrot: Carrot cake makes a brilliant alternative to more common flavours such as chocolate and fruit. Carrot cake can be very moist, particularly when paired with buttercream, so it may not make a suitable bottom tier flavour choice. Pink Champagne: Cake, bubbly and weddings are a matched made in heaven so it’s no surprise that pink champagne flavoured wedding cakes are increasing in demand this year. The pretty shade can be achieved using our pink Colour Splash food colouring gel too. Popular fillings for a champagne cake include rum flavoured custard, white chocolate or rich whipped cream. Coconut and Lime: Channel the tropics with this surprisingly delicious flavour combination. Coconut has surged in popularity over recent years and the addition of tangy lime filling gives it that extra kick that guests will love. This fun-filled flavour is perfect for summer weddings or tropical destination weddings. Marble cake: Can’t decide between vanilla and chocolate? Who says you have to! The two popular flavours work incredibly well together to create an irresistible marble cake that is guaranteed to tantalise your guests’ tastebuds. We also offer a range of delicious dietary cake flavours including our popular eggless wedding cake flavour, vegan wedding cake flavour, gluten free wedding cake flavour and our new sugarfree wedding cake flavour. What flavours will you be trying out for your big day? Why not try one of our delicious wedding cake taster boxes.